Carl Icahn stirs the pot at Clorox, offering to buy the home products maker for $76.50 a share. NEW YORK (CNNMoney) -- Carl Icahn has offered to take Clorox private in a $12.6 billion deal, the activist investor disclosed Friday. Under the terms of the offer, Clorox shareholders would receive $76.50 per share in cash, according to a regulatory filing. Shares of the household products maker surged 9% in early trading. The stock has gained over 8% so far this year. Clorox confirmed in a statement that the company had received the offer and said its board "will review the proposal in due course." In a letter sent Thursday to Clorox (CLX, Fortune 500) chief executive Don Knauss, Icahn states that the offer represents a 21% premium to the company's share price on Dec. 20, 2010. That was the day before Icahn initiated his investment in the company. 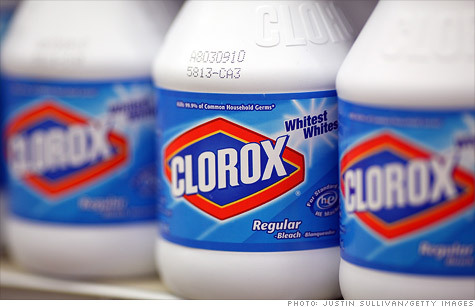 Based on the number of Clorox shares currently outstanding, the offer is worth about $10.2 billion. It represents a premium of about 12% to Thursday's closing price of $68.43 a share. Icahn, who already owns a big stake in Clorox, said the offer would include $7.8 billion in financing from Jefferies & Company at an interest rate of less than 6.5%. The deal includes a $100 million "extraordinary fee" that Icahn would pay Clorox if the funding falls through. The company has until July 29 to publicly accept the offer. The rest of the offer consists of $4.8 billion worth of Clorox shares that Icahn and his affiliates already own, and $3.8 billion in cash on hand, according to the filing. In the letter, Icahn notes that Clorox expects to fall short of its annual sales targets for this year and next. But he adds that the company is a prime takeover target, given current low interest rates and a host of potential buyers. "While this poor performance has lessened the prospects for Clorox shareholders on a standalone basis, our perspective is that the prospects for shareholders have never been greater in terms of a sale of the company," the letter states. As the company's largest shareholder, Icahn encouraged Clorox to explore competing offers from rival companies, including Johnson and Johnson (JNJ, Fortune 500), Procter and Gamble (PG, Fortune 500), Colgate Palmolive (CL, Fortune 500) and Kimberly Clark (KMB, Fortune 500). "We understand that we are a financial buyer that lacks inherent synergies and therefore strongly suggest that the Board aggressively pursue a transaction with a strategic buyer, which should attract a higher price," the letter states. Icahn is known for taking an active role in managing the companies he invests in. Other big Icahn holdings include Biogen Idec (BIIB, Fortune 500), Lions Gate Entertainment (LGF), as well as shares of both Motorola Solutions (MSI, Fortune 500) and Motorola Mobility Holdings (MMI).